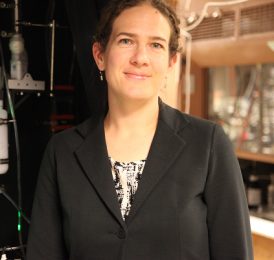 March 16, 2016 – NASA has selected CU-Boulder researcher Raina Gough to join the Mars Curiosity rover mission as a participating scientist; she hopes to expand the science team’s search for evidence of liquid water. In the laboratory, Dr. Gough and her colleagues have shown that a process called deliquescence may create briny liquids under conditions likely to exist, in certain times and places, on Mars’ surface. Gough, a research scientist who works with Distinguished Professor of Chemistry and Biochemistry Margaret Tolbert, is one of six new Curiosity project scientists from around the world. Other new participants from NASA’s Marshall Space Flight Center, the University of Michigan, the U.S. Geological Survey, the Jet Propulsion Laboratory and Pennsylvania State University join about 120 other scientists who are already part of the Mars Science Laboratory Project, which built and operates Curiosity. The Curiosity rover, which landed on the red planet in 2012, houses the Mars Science Laboratory, which includes an advanced suite of instruments designed to analyze the geology of the planet, as written into the composition and structure of its rocks and soils. Read more about Dr. Gough’s work in Spheres, a CIRES magazine. CIRES is a partnership of NOAA and University of Colorado Boulder.